These simple 3D renderings (Renderworks) show the proposed projector layout in relation to the set and theatrical lighting. Four Epson projectors cover the Stage Left and Stage Right walls while a fifth projector covers the upstage scrim behind the band. This projector layout is designed to create an immersive experience for the audience and speaks to the concert-esque style that the musical is structured on. Below, Carolina Xique stands amidst color photos of police brutality victims mapped to the sound panels of the theatre walls. In the background, a collage of many more victims covers the walls in black and white. Upstage, #SAYTHEIRNAMES is projected in bold text on the scrim. Slow motion moving portraits of the cast lined the theatre walls when each ensemble member shared their personal stories or sang a song. Above: Alex Billings projected during her rendition of Radiohead's Creep. These portraits were paused during a personal story, then came to life with the music. Below: A camera slowly panning across a field of daisies was layered over looped moving portraits of Carolina Xique and Kaleigh Clark during their duet of "For Good" from Wicked. 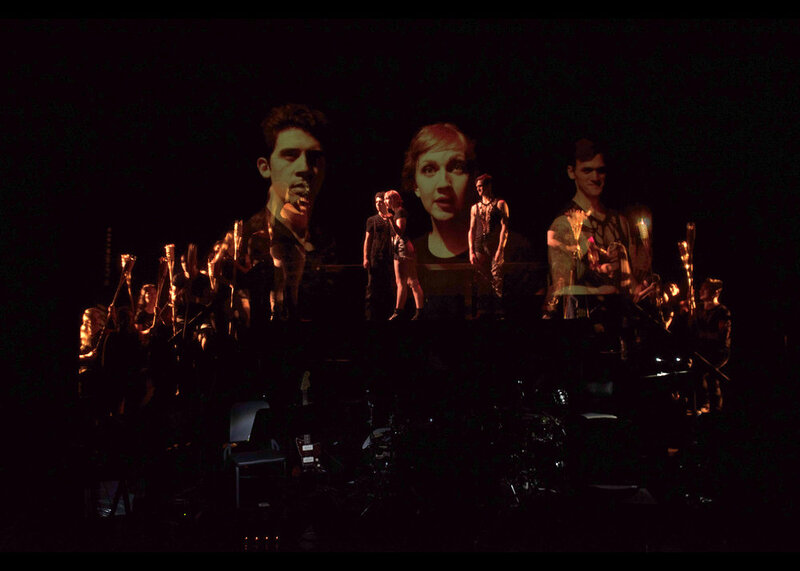 Footage from a live camera operated by an ensemble member is layered on the upstage scrim over the three members performing a triptych by Alex Billings. The same footage is projected on the stage left and stage right walls so all audience members can have an intimate experience with the camera. Silhouettes of female ensemble members are projected on the theatre walls during a song and dance medley. After an intense selection of stories from female ensemble members regarding sexual assault, they sing a medley of songs such as "Warrior" and "Titanium." As they crescendo, digitized hand-drawn "Me Toos" appear on the theatre walls - slowly at first, until the walls are entirely filled with text. Bold text is used a s a through-line in the piece. These grafitti-style red fonts helped to divide the piece into chapters, while white fonts punctuated what the ensemble members were saying and sometimes acted as translations (as seen below). 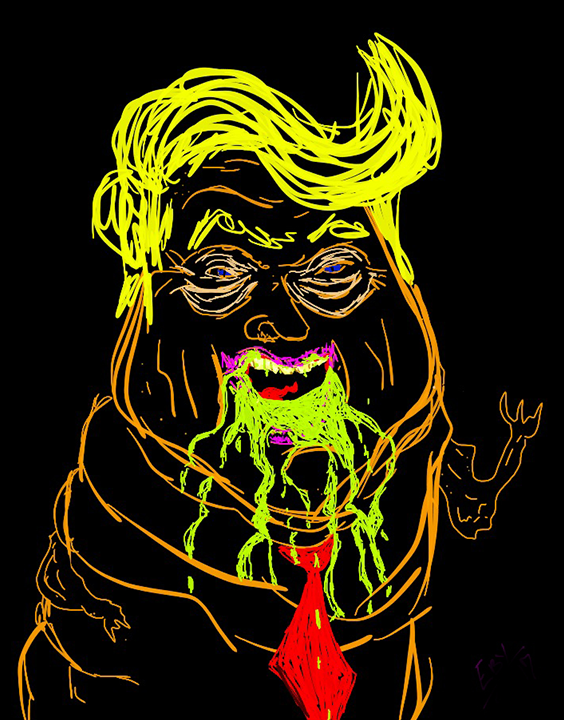 (Below) A production of ensemble member Rob Bergman acts as a physical caricature by wearing Donald Trump mask while tapdancing and singing "You'll Be Back" from Hamilton. In the background you can see the caricatures drawn by Caitlin Eby projected on the Stage Left wall. A drawing by ensemble member Carolina Xique projected in Act I.